This simply-named level is Tim's first public release and it's not bad at all. 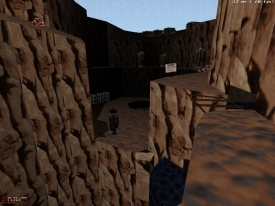 "Cavern" takes places around a canyon area where a bunch of aliens have set up a base. Outdoor areas look pretty good but are modest in the sense that there's no feeling of you being in what is supposed to be just a part of a much larger location. I'd put the way the rocky terrain looks somewhere above average and I was glad to find more vegetated areas as well. One thing I noticed was the lack of sounds: there were places where you'd have expected to hear the sound of a waterfall or wind. There's also a base part that takes about one third of the map. The place is pretty generic, just a bunch of grey rooms connected together so there's hardly any sense of location. Lighting is good all around the level but does not compensate for the lack of details inside the base. You also come across a pretty detached mining area but it's perhaps the most interesting location in the map. You get to kill a few bad guys with the pistol before getting your hands on a shotgun. From here on the level stays pretty balanced with a good amount of both strong and weak enemies and enough health to go around. There's nothing remarkable about puzzles, except that you get to choose the order in which you collect two key cards. Fun but nothing special. So, for the next round I'd suggest Tim to pay more attention to indoor detailing, ambience sounds and to creating a sense of location instead of just a gameplay area.